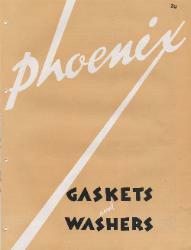 1948 Phoenix Specialty Manufacturing Co., Inc. Corrugated Metal-Asbestos Gasket-No. 2 (Pressures to 600 lbs. compensate for flange irregularities and piping misalignment. jackets for Heine and Babcock & Wilcox boilers.